Fantasy author Nancy A. Hansen once again works her own unique brand of word magic in THE SONG OF HEROES, a new story collection from Pro Se Productions, now available in digital and print formats. Of the ancient immortal mer-folk clan, Lori is the deadliest amongst them. An incredibly lovely, tall and curvaceous gray-eyed blonde with a mesmerizing voice, she once used her talents to lure unwary mariners to their doom. Held hostage by the Elder Gods through her reluctance to endanger the remainder of her kind, she now serves a higher purpose. The great pearl ring of her heritage is shackled by a fine chain leading to a rune-embossed silver bracelet that must never be removed. When unlinked, it can call forth her 'heroes'—four eternal warriors of old. All five have disgraced themselves in their previous incarnations and now do penance by ridding humanity of menaces both mortal and undead. Four stories of violent redemption and reprisal involving mystery, suspense, and dangers both in the world of humankind and of the supernatural sphere comprise THE SONG OF HEROES. Meet Lori's four compelling colleagues: Sir Reginald the Paladin, Serge the French executioner, Modak the Cannibal King, and mysterious Herne the Hunter. With sword, axe, spear, and bow they guard their mistress and do her bidding—often reminding Lori of her own debt to those they now protect. Come trembling mortal, and travel into the gruesome world of the deathless avengers and listen again for THE SONG OF HEROES to rise on the salt sea breezes. By Nancy A. Hansen and from Pro Se Productions. Featuring an atmospheric cover by Lissanne Lake and cover design and print formatting by Antonino Lo Iacono and Marzia Marina, THE SONG OF HEROES is available now at Amazon at https://www.amazon.com/Song-Heroes-Nancy-Hansen/dp/1974010996/ref=tmm_pap_swatch_0?_encoding=UTF8&qid=1501593437&sr=1-3 and Pro Se’s own store at www.prose-press.com for 15.00. 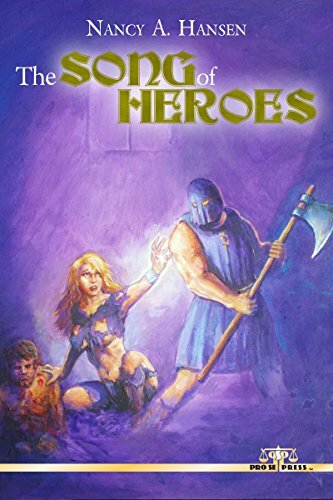 This unique fantasy collection is also available as an Ebook, designed and formatted by Lo Iaconoand Marina for only $2.99 for the Kindle at https://www.amazon.com/Song-Heroes-Nancy-Hansen-ebook/dp/B074D5VK6H/ref=tmm_kin_swatch_0?_encoding=UTF8&qid=1501593437&sr=1-3. THE SONG OF HEROES is also available on Kindle Unlimited for free to Kindle Unlimited members.